Frederic Dan, the youngest of Dan and Elizabeth Huntington's eleven children, was born in Hadley on May 28, 1819. He grew up on the farm at "Forty Acres" and went to college in nearby Amherst, graduating as validictorian of the class of 1839. He studied for the ministry at the Harvard Divinity School and was ordained as a Unitarian minister in October 1842. On September 4, 1843 he married Hannah Dane Sargent. The couple had seven children, five of whom lived to adulthood. In 1861 he entered the priesthood of the Episcopal Church and was appointed the first Bishop of Central New York in 1869. During his life, Bishop Frederic Dan Huntington published numerous books and pamphlets, as well as weekly newspaper columns and many articles. He did editorial work for the Christian Register, the Monthly Religious Magazine, the Church Monthly, and The Gospel Messanger. Bishop Huntington spoke and wrote on social readjustments and the relations of labor and capital. 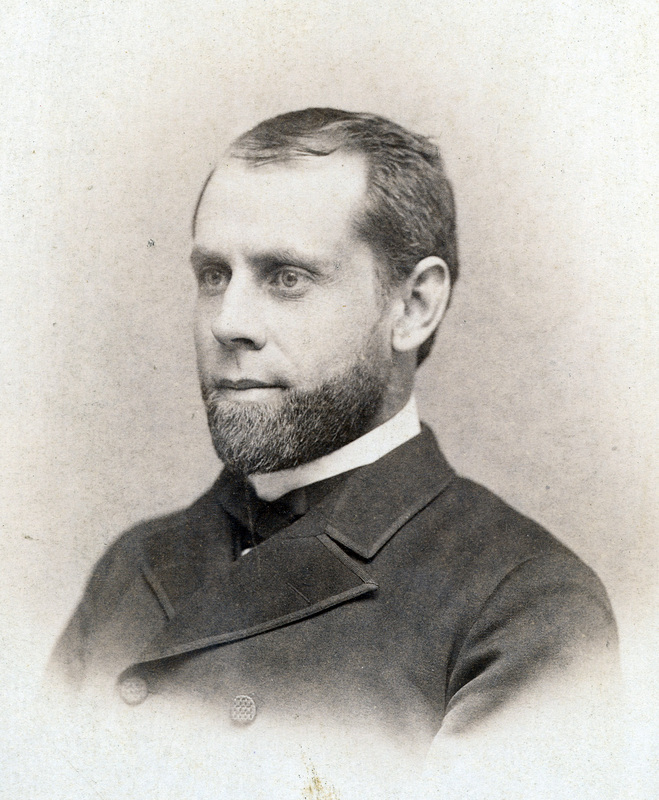 He was president of the Christian Social Union and the Church Association for the Advancement of the Interests of Labor. The Bishop was also involved in raising funds for the erection of a number of institutions in the Syracuse area. These included the Protestant Hospital, the House of the Good Shepard, St. John's Military School for boys, St. Andrews Divinity School, and the Keeble School for girls. The Huntington family loved the old home at "Forty Acres" in Hadley. They spent every summer there, usually arriving in June and leaving in September or sometimes October. Frederic Dan kept the farm running, with a caretaker to oversee things in the winter. During his time in the area, Bishop Huntington was closely involved in the beginnings of Grace Episcopal Church in Amherst. He and his wife are known to have been good friends of the Dickinson family. Memoir and Letters of Frederic Dan Huntington: First Bishop of Central New York, by Arria Sargent Huntington contains a great deal of information about his life, including much insight and information on other members of the Huntington family.